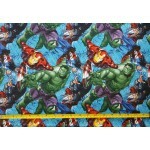 This Dora the Explorer fabric is gorgeous. 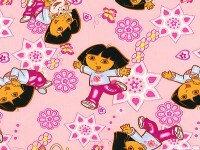 The fabric features Dora running, relaxing and hugging her monkey friend, Boots. It has a pink background with butterflies, hearts, flowers and stars. 100% cotton. Price is per metre. From the 'Dora and Diego' collection, by Viacom, licensed to Franco Manufacturing. This fabric coordinates with the Dora pillow panels which can be found in the pillows and panels category.